Lines stretching far beyond the door are commonplace at each of Portland, Oregon’s Salt and Straw ice cream shops. Locals and visitors alike flock to them – and for good reason. Salt and Straw is an ice cream innovator, concocting dairy and non-dairy ice cream varieties you won’t find anywhere else. By now, you know that I love ice cream – both eating it and making it. I have enjoyed and often preferred wonderful ice cream from all over the world, and I have to say after recently trying establishments like Jeni’s and Salt and Straw, the USA has come a long way in improving the quality of small-batch ice creameries in the past few years. Salt and Straw has ridden the wave both of Portland’s vibrant food scene and of a growing trend for what I call haute creameries that incorporate the best in technique and technology, fresh and novel ingredients, and creative flavor profiles. 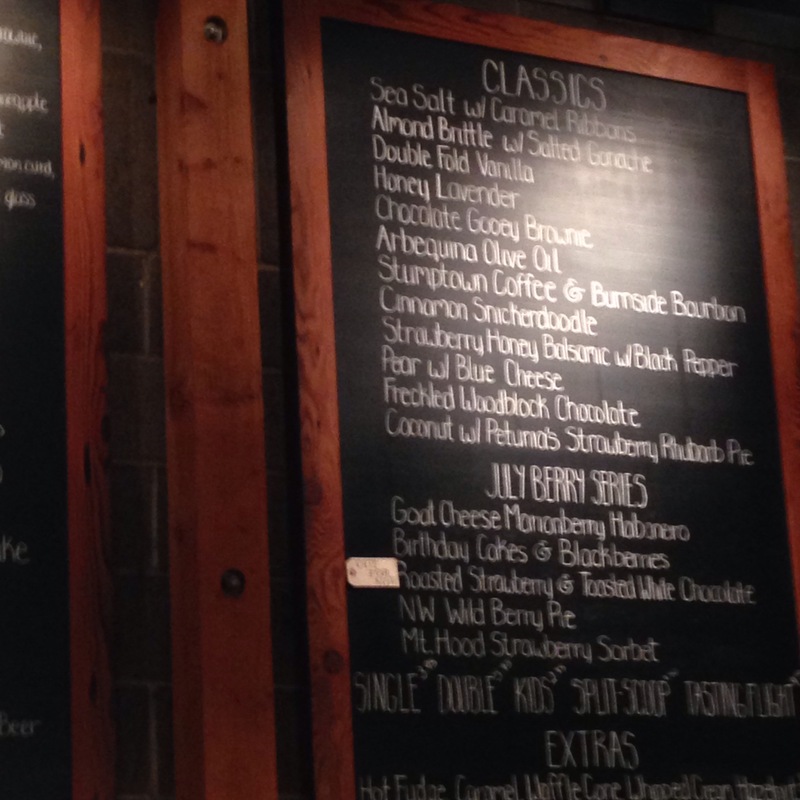 Salt and Straw has mastered the trend, perhaps even aided by its odd name. Its ice cream, sorbet, and coconut milk/cream bases are rich, dense, and smooth. Everything is fair game for flavorings: from chocolate covered peanut butter pretzels, local marionberries with habanero and goat cheese, olive oil, strawberry with balsamic vinegar and black pepper, pear and blue cheese; brownies with brownie batter; local coffee and bourbon; homemade almond brittle; to a special series of ice creams incorporating local, seasonal berries. Unfortunately, I was too full to try a tasting flight of four ice cream flavors, so I chose the salted ganache with almond brittle. Its dark chocolate ganache had the most subtle hint of sea salt (I would have added more), and the homemade almost brittle paired with the ganache so well that I could barely separate the elements of the ice cream. I sampled a few others, such as the Marionberry, goat cheese, and habanero, but it was the coconut milk based, nondairy coconut rhubarb pie that all but obliterated the memory of any other flavor. The coconut was so light and the texture so creamy that my sensitive tastebuds still wouldn’t have realized it was nondairy. The sweet, oversized chunks of rhubarb pie were luscious, bursting with fruit and with the nice contrasts in texture from the cream base, gooey fruit filling, and comforting pie crust. I don’t know why it has never occurred to me to put chunks of pie in ice cream, but what an essential twist on pie a la mode! 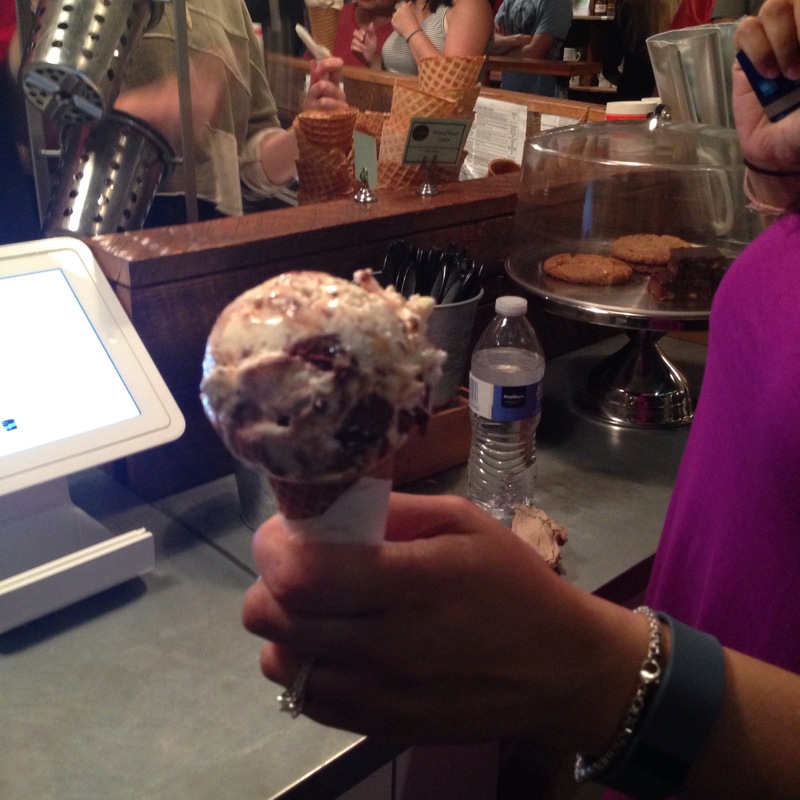 My brief fling with Salt and Straw left me wanting more. I can’t wait for my next visit to Portland and a tasting flight or heaping waffle cone of the flavors I didn’t try from Salt and Straw.